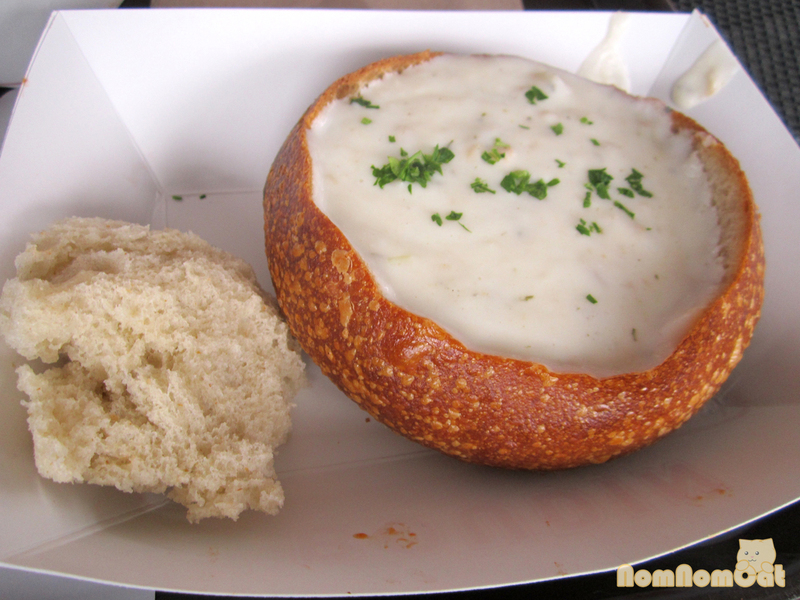 Delicious New England clam chowder bread bowl! Less than a block away from Boudin is a strip of seafood stands and restaurants selling fresh seafood from simple steamed preparations to deepfried and ceviche. We decided to conduct our own impromptu oyster tour, starting with Nick’s Lighthouse. Here we ordered a pair of shucked-to-order oysters on the half shell from East Point. 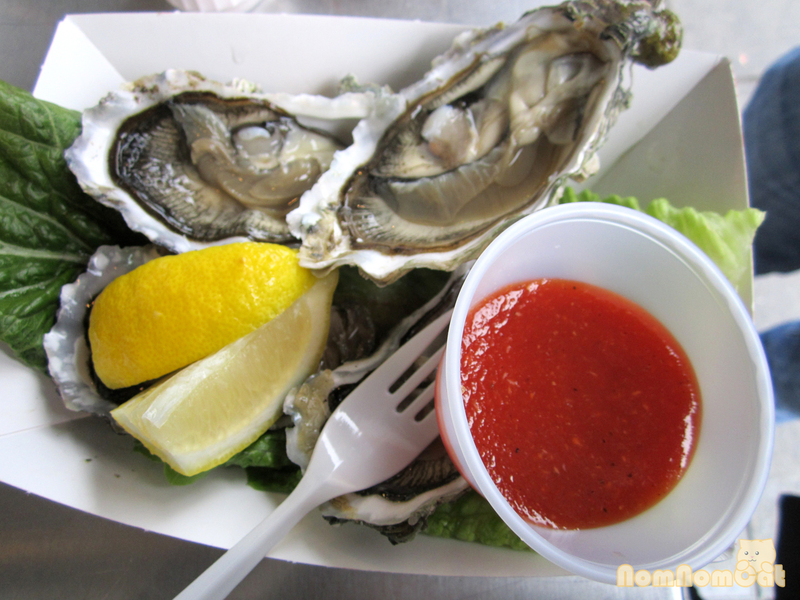 Briny and delicious! Our second (and last) stop was Sabella & La Torre’s. We shared an order of 4 oysters on the half shell with what seemed to be a homemade cocktail sauce. That was awesome and full of flavor, although it overpowered the oyster a bit. We made our way over to the Musée Mécanique and to the docked warship before heading up to Del Monte Cannery Square. Craving something sweet, we stopped by Norman’s Ice Cream and Freezes, a little mom & pop ice cream shop hidden away in the corner of the Square. 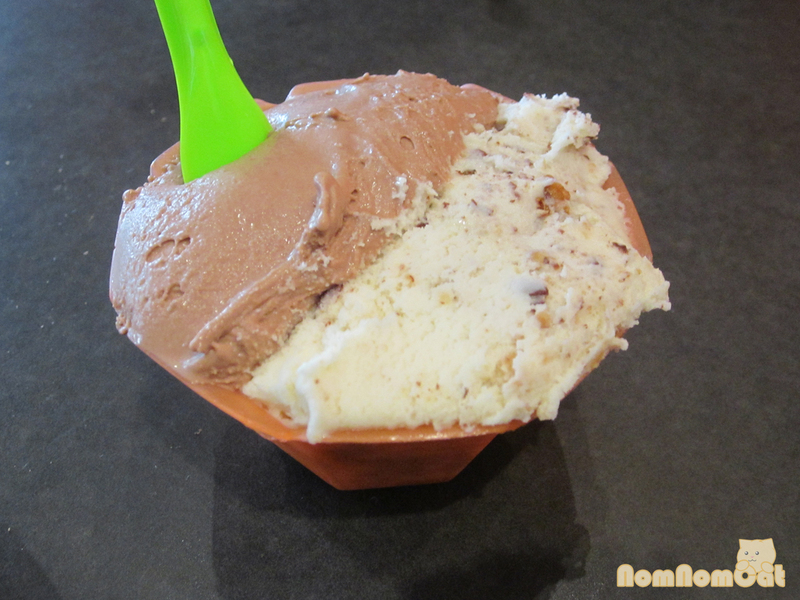 The local favorite flavor is chocolate caramel crackle, so we shared a scoop. 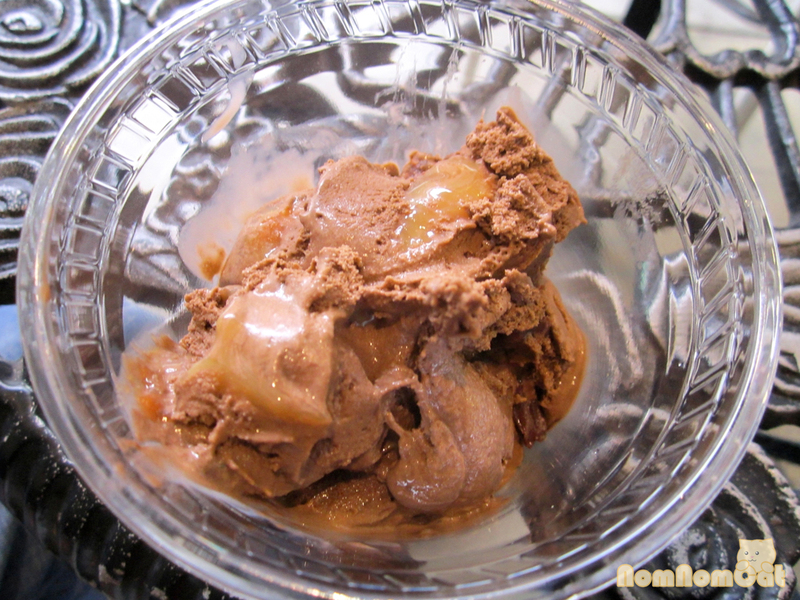 It basically tasted like a Snickers bar in ice cream form — rich and creamy chocolate ice cream, ripples of dulce de leche, and bits of crunchy “crackle” (I think it was a nut-and-nougat concoction). We can see why it’s a best seller! Onward and upward we went toward Ghirardelli Square, home of the infamous Ghirardelli Chocolate Shop and Ice Cream Shop. They give out samples right when you walk in, and this festive time of year, the samples are whole squares of peppermint bark – our favorite! 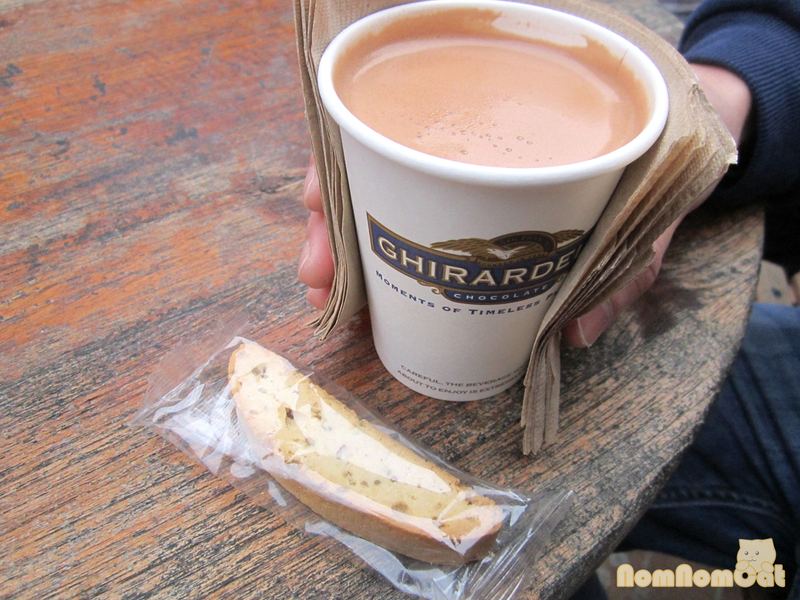 Lines for the ice cream shop were ridiculous, so we went around the corner up the hill to the other (also Ghirardelli) ice cream shop and shared a decadent drinking chocolate with biscotti. It was like sipping liquid chocolate — so sinfully delicious! The biscotti was a bit disappointing, but then again, the individually wrapped pre-made stuff just isn’t the same once you’ve had fresh, crumbly homemade biscotti. 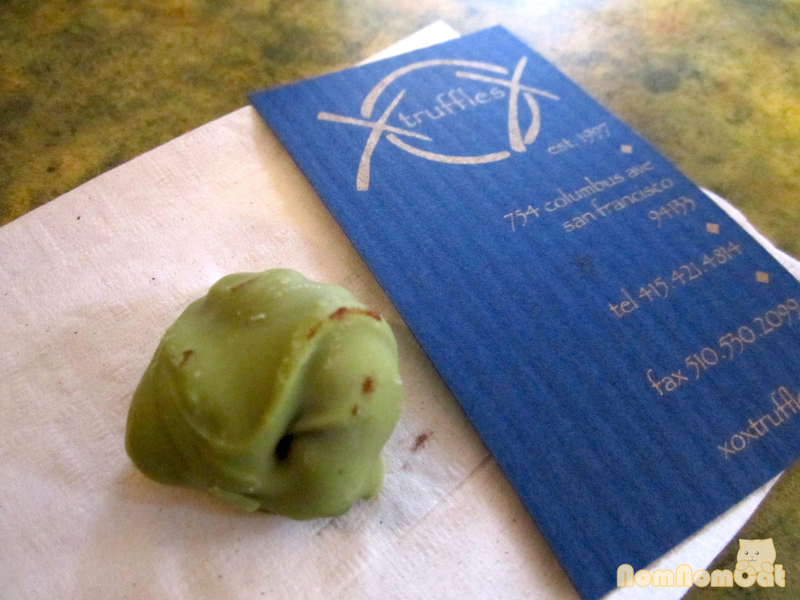 My little matcha sweet treat from XOX Truffles. Martin ate his before it could be captured on film. 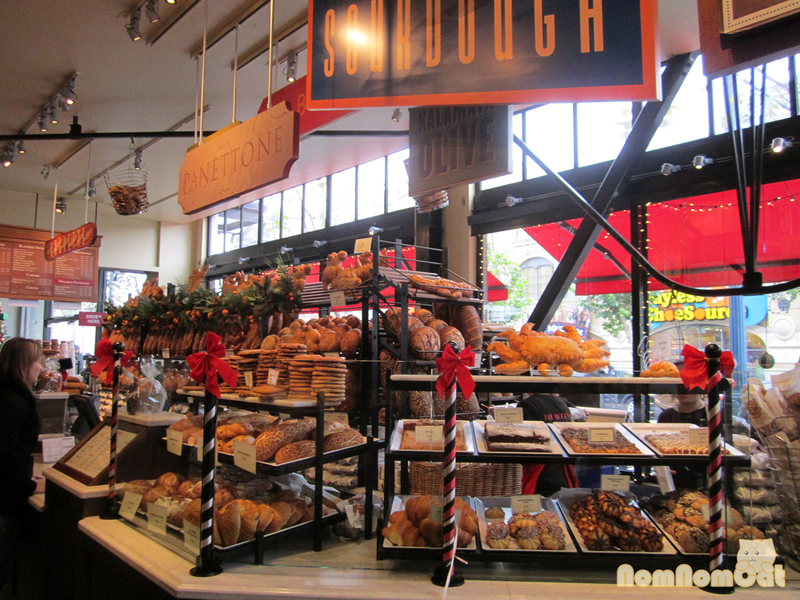 We finally had our fill of browsing the shiny wrappers and tempting gift sets of chocolate, so we walked up Columbus Avenue to Little Italy / North Beach. We walked past so many shops and storefronts that it was dizzying. However, I spotted one that I had seen previously on Yelp and knew we just had to stop in. XOX Truffles, a tiny hole-in-the-wall truffle shop popular for their variety of unique handmade truffles (the chocolate treat, not the expensive fungi) in over thirty flavors. We wanted to try all of them, but since they package your order together in a small Chinese takeout box, we were worried the flavors would meld by the time we got them home. Instead we each picked out a flavor and enjoyed them right in the shop. I had the matcha and Martin had the classic milk chocolate. The chocolate had a wonderfully smooth texture and mine took on a delicate hint of green tea flavor. Very yummy and very legit tiramisu! As we continued our trek through Little Italy, we stumbled upon Stella Pastry and Cafe and decided to abide by one of my favorite bumper sticker slogans – Life’s too short, eat dessert first! 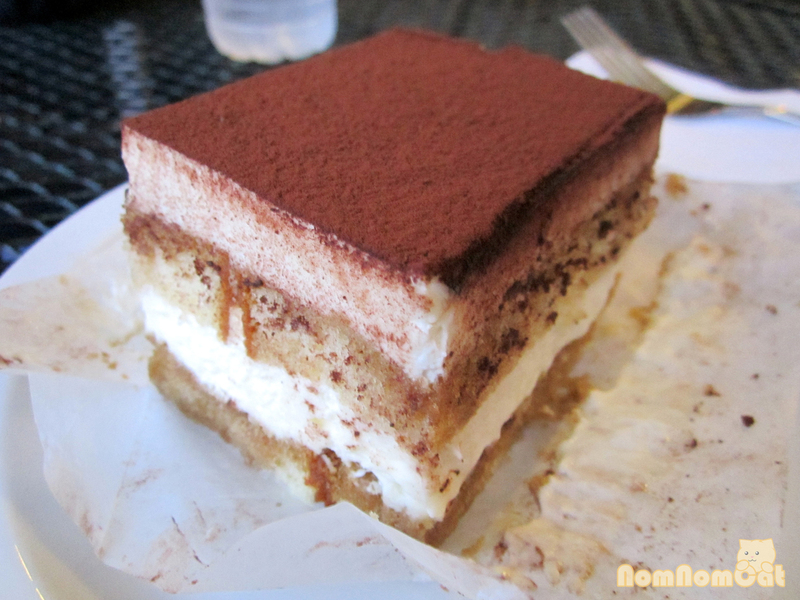 They are known for their sacripantina, but one look at their tiramisu and I knew we had to try it instead. The tiramisu here was fluffy and wonderfully drenched in espresso. The lady fingers, however, were not fingers but instead thin slices of cake. The creme was nice and smooth, not too sweet, with lots of powdered cocoa for garnish. We already had dinner plans with Martin’s friend Jay W., but we just could not pass up the opportunity to try award-winning gnocchi! Our impromptu executive decision was to hit Firenze by Night Ristorante right when they opened for dinner service at 5pm. Martin and I were one of the first tables seated and ordered the gnocchi entree right away. The service was quick and friendly, and we loved the rustic-looking mural in the dining room. When our entree arrived, we saw that they even split it into two dishes for us in advance! The deliciously dense clouds of potato dumpling goodness, covered in a velvety sauce of tomato and cheese. 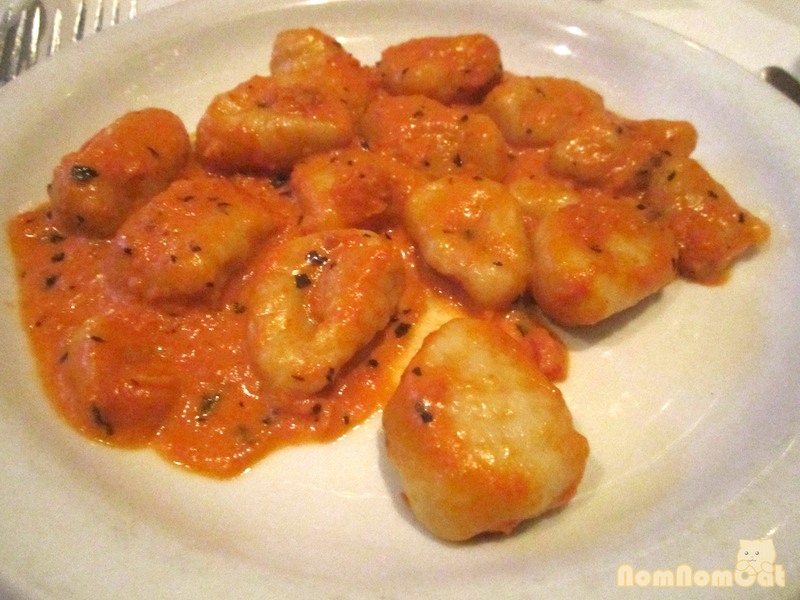 We could definitely see why these gnocchi were so acclaimed! Having rushed through our prevening meal, it turned out that we were still early for our dinner plans, so we stopped by a nearby cafe to cleanse our palates with a bit of dessert (again). Cavalli Cafe is a quaint little coffee shop that offers free wifi (although no power outlets) and their dessert selections include homemade panna cotta. 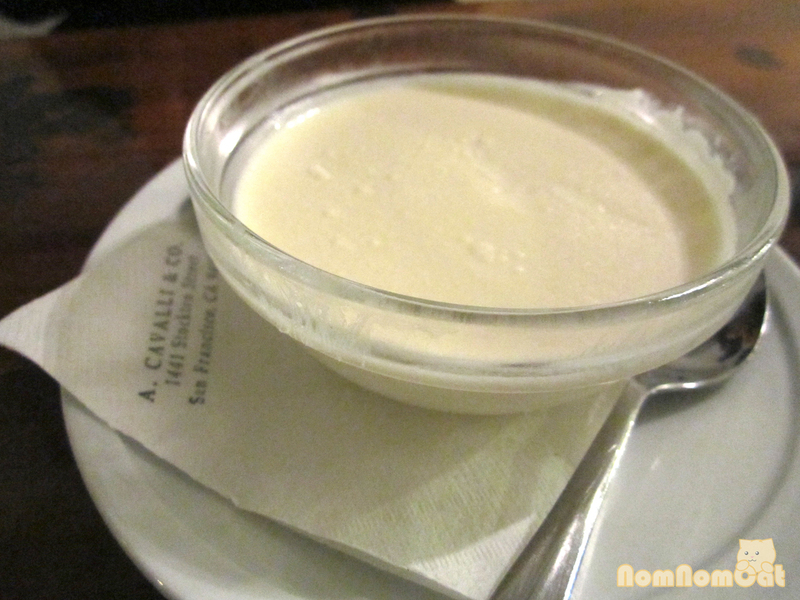 No fancy coulis or compotes – this no-frills panna cotta was served as is in a little bowl straight from the refrigerator and it was beautifully simple. It had a delicate vanilla flavor and a pleasantly light texture. Finally it was time to meet with Jay W. for dinner. Unfortunately, the wait for Tony’s Pizza Napoletana had grown exponentially without our realizing it, so we put down our names and headed across the street to Caffe Roma Coffee Roasting Co. to kill time and catch up. Martin had a caramel latte and I had a nonfat cafe au lait, as usual, but Jay went out of the box with something that looked as crazy as it sounded – a Nutella latte. It was basically a regular ol’ cappuccino served with a spoon heaped with Nutella. Just stir the chocolate hazelnut heaven into the hot coffee and voila – Nutella latte. Yum! I’ll have to try this at home sometime. Finally the quoted hour-long wait had elapsed and we headed back to Tony’s Pizza Napoletana and straight to our table. 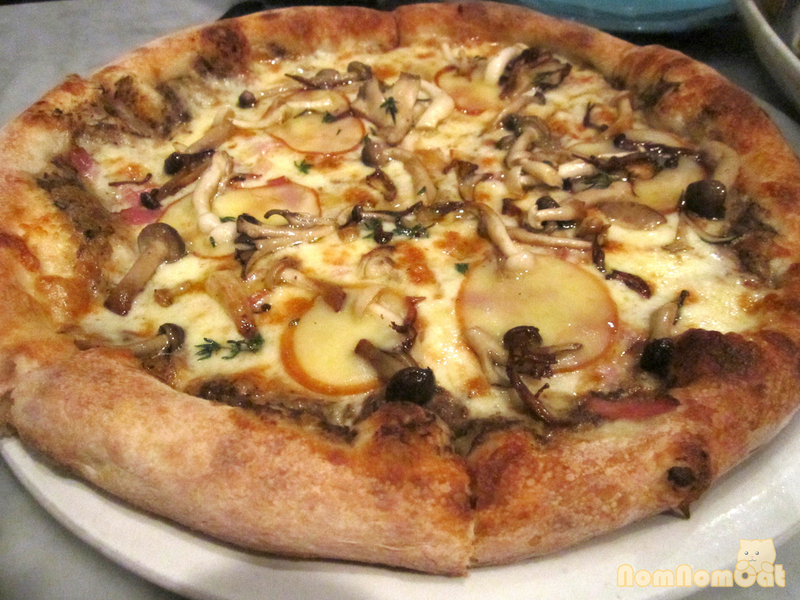 They are touted as having the best pizza in SF and we could certainly see why! They were completely sold out of their award-winning margherita pizza, with a crust made from san felice flour (I honestly have no idea what this is but for the sake of this anecdote, let’s assume it’s a special fancy type of flour). 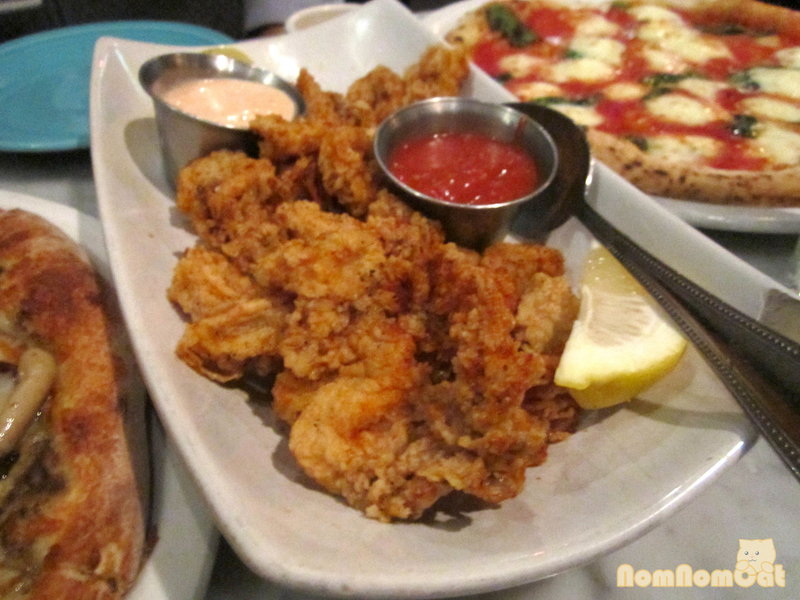 We opted for the calamari fritto misto appetizer calabrese style, which added heat and a nice kick to plain ol’ fried calamari. For pizzas, the three of us shared the pancetta porcini and the regular margherita pizza. 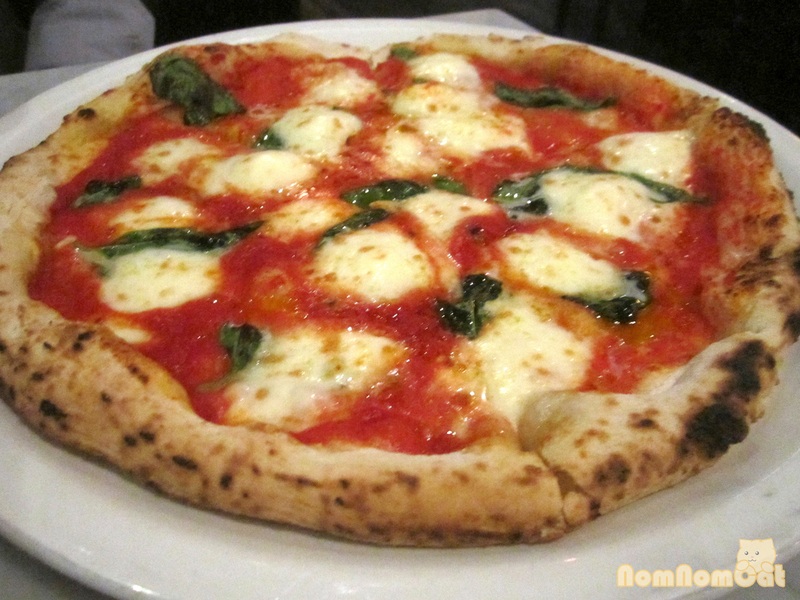 Martin and I both love margherita pizzas, and this one certainly did not disappoint. If anything, it just made us wonder how much of an impact the elusive san felice flour would have had. All the more reason to return! Pancetta Porcini Pizza drizzled with truffle oil... get it! The boys let me pick the other pizza — pancetta porcini. I think I picked a winner, if I do say so myself. We were a bit put off by the menu description that mentioned ‘no sauce’, but then look again – this pizza is drizzled with truffle oil! DELICIOUS. DO IT. 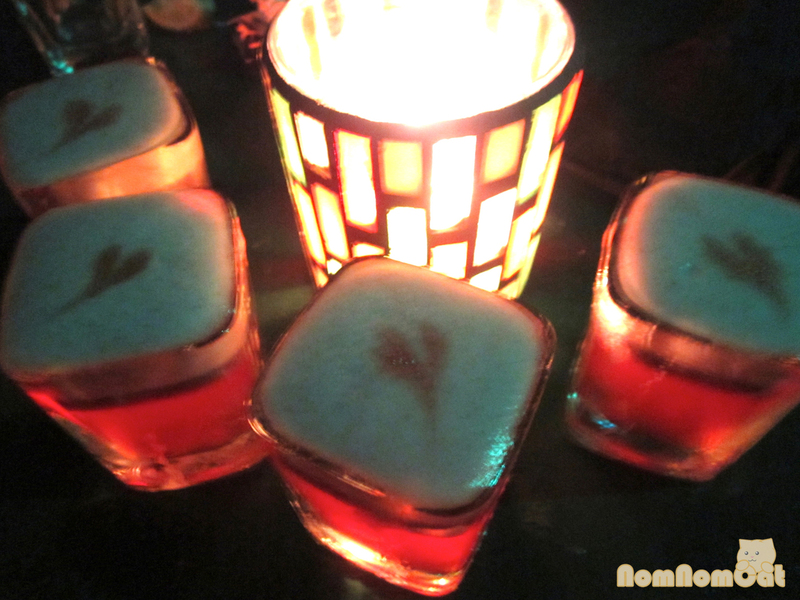 Field of Hearts - a fruity shot topped with froth and red food coloring in the shape of a heart! After dinner, Martin and I went to meet up with some of my friends for a birthday shindig at Cantina. We hadn’t been out clubbing and partying in a long time, so it was a welcome change. Cantina is known for a specialty cocktail called the Laughing Buddha, made with muddled ginger, very quickly squeezed fresh lemon juice, and rum. Spicy and icy. Our friend Helen picked out a round of shots called Field of Hearts, made with frangelico hazelnut, strawberry liquer, and Midori, among other ingredients. Never had it before but it was delicious, frothy, and sweet. Not to mention, it was decorated with a drop of red food coloring skillfully whisked into the shape of a heart. Yes, it tasted just as girly as it sounds. 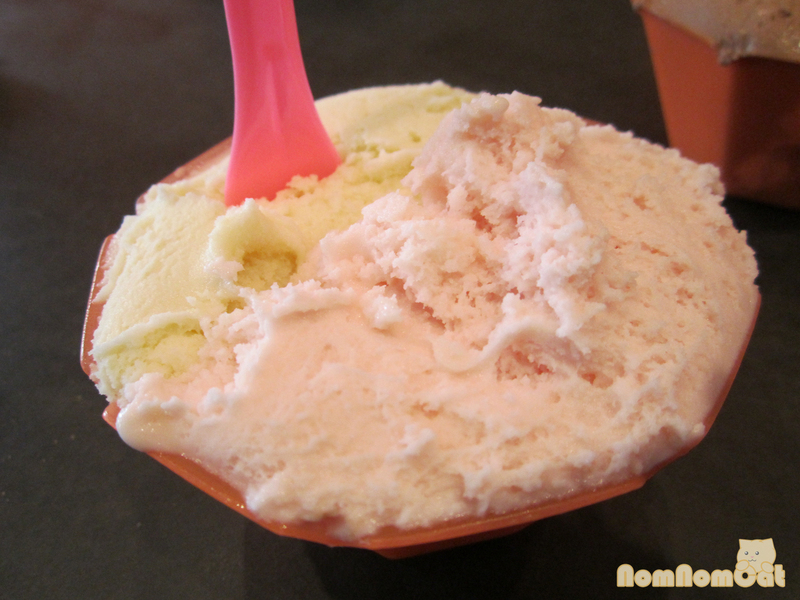 Earl Grey and Rose Gelato - the breakfast of champions! The next morning, we strolled along Columbus yet again and decided to have dessert for breakfast. Gelateria Naia, with its dozens of homemade exotic and specialty flavors of gelato and sorbetto, definitely hit the spot. It so hard to choose, especially if you’re as indecisive as I am, but I finally settled on the Earl Grey and Rose, and Martin got the Nutella and Biscotti. So delicious! His was sweet and decadent while mine was delicate and floral. Both were nice pairings; if only we had more time in SF to keep coming back and try all of the flavors! Martin's sweet tooth compelled him to get the Nutella and Biscotti flavors. Yum! Phew! What an adventure of experiencing a city the best way we know how — through its food. See Yelp reviews for Nick’s Lighthouse here. And for Sabella here.